Statistics show that 144 people are killed annually in workplace accidents in the UK, with another 20,000 workers suffering serious injuries and many of these incidents involve the warehouse staple – the forklift truck. There are a number of common accidents involving forklift trucks and these include forklifts overturning due to unseen obstructions, careless driving (this makes up 25% of all forklift accidents) and, personnel being struck by a forklift truck due to one or both of the above but one other factor stands out above the rest – untrained staff using equipment. As the Christmas season approaches, supply chains up and down the country will be experiencing increased demand for their products which is, of course, great news for sales but, with increased demand for goods comes the need for an increased workforce and, for many organisations, the most cost effective method of tackling this issue is to employ temporary staff for the busy period. Although there are many benefits to keeping a fluid workforce during busy periods, there can also be major drawbacks. When temporary staff are not trained properly on company procedures and the handling of equipment then accidents are likely to follow and these can be time-costly for the organisation and, sometimes, lead to hefty insurance payouts. In the UK, staff are required to complete training and acquire a license from one of six accreditation agencies before they are permitted to operate a forklift truck in the workplace. It is vital that an organisation takes responsibility for ensuring that all employees have the correct qualifications and training – in fact, it is illegal for a company to employ an untrained forklift driver, meaning that the company will be liable for any accidents or injuries that occur. It is also against the law for anybody below school leaving age to operate a forklift truck so, although school children may be employed in warehouses for work experience, it is imperative that they are not permitted to use the forklift trucks. Forklift accreditation courses usually run between one and three days, depending on the intensity of the training required and can cost from £100 for a refresher course to around £750 for a complete beginner. As well as ensuring that the correct training is provided, there are a number of ways in which an organisation can improve forklift truck safety both for drivers and for those working around them. In an age where technology moves fast, there are constantly new innovations in the quest to improve safety for forklift drivers and pedestrians and these include options such as LED driving path warning systems and Near-Field Electromagnetic Ranging Real Time Location Systems which operate by sensors being fitted to the forklift which then activate lights or audio warnings to alert drivers and pedestrians. Although impressive, this level of technology is, of course, expensive and is no substitute for common sense and paying due care and attention to the job at hand. The forklift trucks themselves should be kept clean and maintained regularly by a licensed professional in order to limit the chance of malfunction. Once work or checks have been completed, the correct documentation should be supplied and displayed. The keys to the forklift should always be removed at the end of an operator’s shift and kept in a safe and secure place to prevent unauthorised use of the vehicle. All driving areas should be sufficiently wide enough for the truck to pass safely and have adequate clearance from overhead. Floors should be kept as flat as possible and be swept regularly to ensure that they are clear from obstruction. 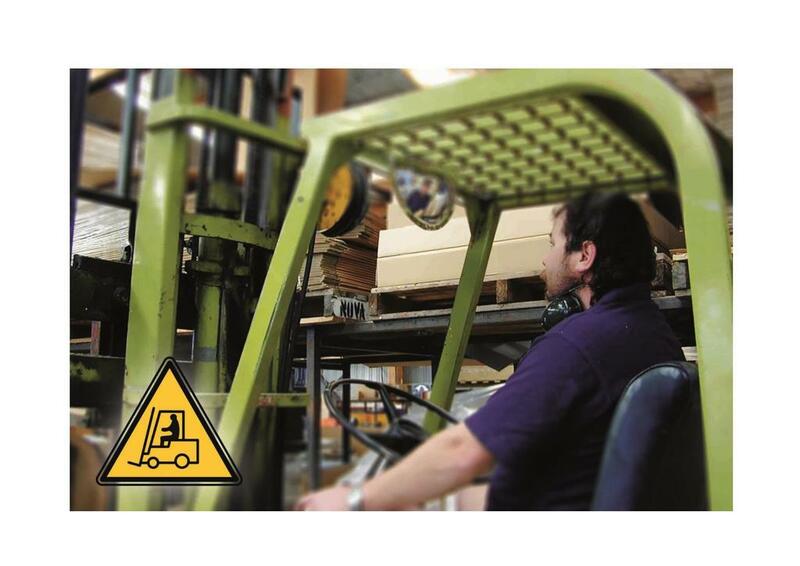 Drivers should always keep to or below the speed limits posted in both the workplace and in the forklift truck, particularly when negotiating corners and should never attempt to stop, turn or change direction suddenly. Before setting the truck into motion, the driver should ensure that the load is stable and within the permitted weight limit and, where possible, ensure that the loader is tilted back with the forks as low as possible to avoid tipping. A simple, effective and inexpensive way to improve security is to fit forklift trucks with a convex mirror such as Securikey’s forklift rear view mirrors which provide a clear 180 degree view and significantly help to eliminate blind spots. Safety mirrors should also be fitted in areas of the warehouse where visibility is limited. With Christmas just around the corner for warehouses, now is a good time for companies to review their security and safety policies and to act accordingly. Many of the measures mentioned in this article are inexpensive and relatively easy to install – but may mean the difference between a season of good cheer and one that costs a company dear.